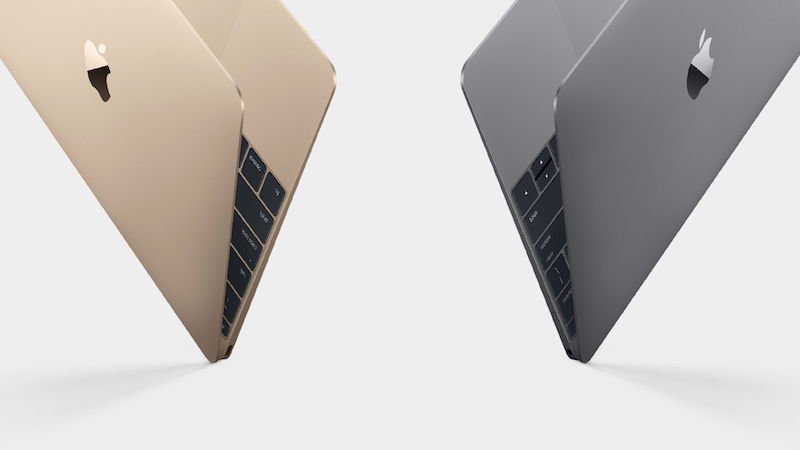 The 12-inch MacBook is separate from the company's MacBook Air and MacBook Pro lines. It weighs 2 pounds and is 24 percent thinner than the existing MacBook Air at 13.1mm. It's available in three iPhone and iPad-style colors: gold, silver, and space gray. With the new MacBook, Apple has introduced a redesigned keyboard, featuring a new butterfly mechanism for the keys to make them both more stable and more precise. The edge-to-edge keyboard offers keys with 17 percent more surface area and a redesigned feel. "Apple has reinvented the notebook with the new MacBook, and at just two pounds and 13.1 mm, it's the thinnest and lightest Mac ever," said Philip Schiller, Apple’s senior vice president of Worldwide Marketing. "Every component of the MacBook reveals a new innovation. From its fanless design, ultra-thin Retina display and full-size keyboard that’s 34 percent thinner, to its all-new Force Touch trackpad, versatile USB-C port and breakthrough terraced battery design, the new MacBook is the future of the notebook." Apple's new MacBook also includes a completely revamped trackpad, with built-in Force Touch. Force Touch can detect the amount of pressure placed on the trackpad, introducing a whole range of gestures. For example, a hard press using Force Touch brings up a Map in mail, or a Wikipedia entry in Safari, much like right clicking does now. The trackpad also includes haptic feedback, giving users tactile feedback from the trackpad when using it. The trackpad is customizable, letting users choose how much pressure is required to initiate a force press. The 12-inch MacBook uses an Intel Core-M processor that starts at 1.1GHz with Intel HD 5300 graphics. It has entirely silent operation because it's the first MacBook to use a completely fanless design. Internally, the logic board is 67 percent smaller than the logic board in the MacBook Air, and Apple's designed new custom-shaped batteries for the device to eke out as much battery life as possible. According to Apple, the new MacBook has an "all-day battery" life at 9 hours of web browsing and 10 hours of iTunes movie playback. To allow for its ultra thin design, Apple has used a single USB-C port in the MacBook, which combines several functions into a one port: power, USB data transfer, DisplayPort, HDMI, and VGA capabilities. The MacBook does not use the traditional MagSafe charging method that's available in other MacBooks. The entry-level MacBook is priced at $1,299 and includes a 1.1GHz dual-core Intel Core M processor, 8GB of memory, 256GB of flash storage, and Intel HD graphics 5300. There's also a 1.2GHz version with 8GB of memory and 512GB of flash storage available for $1,599. There will be additional configure-to-order options as well. The new MacBook will begin shipping on Friday, April 10 through the Apple Online Store and from Apple retail stores and Apple Authorized Resellers. Bye bye MagSafe :( Probably going to be lots of broken ports now if people trip over your cord. No ports, more money. Not sold on this. I am hoping the other apple laptops will remain. I'm confused. If this isn't replacing the MacBook Air and it's THINNER than the Air, then doesn't the Air kind of lose its meaning? Why can't Apple just leave things alone? Everyone just wanted a Macbook Air with a retina screen. They give you the retina screen but take away all the connectivity. Everyone wanted an updated Mini, they gave us a speed and spec bump but took away the upgradeability. The problem is that Ive has way too much power internally at Apple and no one left to tell him when his **** stinks. He is surrounded by "yes" men. Having absolutely no connectivity so Ive can make the laptop a few millimetres thinner is insanity and evidence of his form-over-function design philosophy taken to the absolute extreme. I guess the wait is over, Apple has finally made a netbook. Just not at netbook prices. This computer is a waste of people's hard earned money. Why doesn't Apple just call it what it is - an ipad with a keyboard. 1 port, no headphone jack, 12 inch screen, weak processor, $1300 base. Spray paint a computer gold and call it "revolutionary"
Sealed the deal on the Retina 13" MacBook Pro for me. Is it just me, or does $1300 seem like a lot for a slow notebook with almost no connectivity? The Core M has has proven to be a dog in other computers, so I wouldn't expect much here either. Concerning to me is the SINGLE USB port, which doubles as the charging port. I hope the charger doubles as a powered hub. They should also be raking in the accessory money again with their new port no one uses yet.